This article, by Tash Shifrin, first appeared on Dream Deferred on 21 March 2019. As “Tommy Robinson” released his Panodrama video in front of up to 4,000 supporters in Salford on Saturday 23 February, he was already expecting the ban from Facebook that followed two days later and urging his supporters to subscribe to his own online channels. It marked an escalation of Robinson’s assault on the media. This is a battle for which Robinson has given the same theoretical justification – the idea of a “great replacement” – that was cited by the suspect in the horrific mass murder of 50 Muslims in Christchurch, New Zealand, last week. While the Facebook ban has attracted most attention, the Salford rally and the Panodrama video are also significant as fascist Tommy Robinson (real name Stephen Yaxley-Lennon) and the new far right movement around him continue to move forward and develop. At the same time, Robinson’s overt politics are hardening up again as he adopts and promotes more and more of the ideology of Generation Identity, the nazi group that wants an all-white Europe. We noted his willingness to embrace and promote GI back in May 2018 but as we shall see, Robinson’s Panodrama video and his later remarks show how he is increasingly becoming a mouthpiece for its ideology. That is significant. It is GI’s theory of the “great replacement” that was chosen as the title for New Zealand mass murder suspect Brenton Tarrant’s manifesto. In the wake of the Christchurch massacre, BBC Newsnight shamefully invited a GI speaker on air to discuss its views – the tiny group’s constant promotion by Robinson has clearly raised its profile too. Facebook’s removal of Robinson was widely welcomed by antifascists – it cuts off a social media platform on which he had built up a following of more than a million people and has been a key propaganda and mobilising tool for him. Facebook’s move against Robinson came alongside a takedown of a number of figures in Britain’s new far right, including his sidekick Danny “Tommo” Thomas, KipperCentral owner Reece Coombes, Veterans Against Terrorism’s Richard Ingram, and the well connected fixer and ideologue Raheem Kassam. Disturbingly, Kassam’s account appears to have been reactivated following an intervention by Donald Trump Junior, the US president’s son. It remains to be seen how many of Robinson’s followers he can take with him to his YouTube channel or to his own branded website, his mailing list or other platforms, such as WhatsApp. But so far, he appears to be maintaining a large audience. The Panodrama video is understood to have had around a million views on Facebook before the ban took effect. It now has another 1.5m views on YouTube, giving it 2.5m views altogether – a figure that compares well against the BBC’s Panoramastrand itself. Robinson’s launch event for his Panodrama video, near the BBC’s Media City HQ, was particularly striking because most people don’t launch videos in this way at all. A video can be released online. But Robinson showed his at a public outdoor event because maintaining a mobilisation of physical force on the streets is essential to his project. Organisers urged the crowd not to attack or manhandle any journalists – “Let them be. Just for today.” The implied threat was clear. Robinson’s readiness to physically intimidate journalists became even clearer in March, when he turned up on the doorstep of antifascist writer Mike Stuchbery in the small hours. I’m going to make a documentary that exposes every single one of you, every single detail about every one of you. Where you live, where you work, everything about you is going to be exposed. 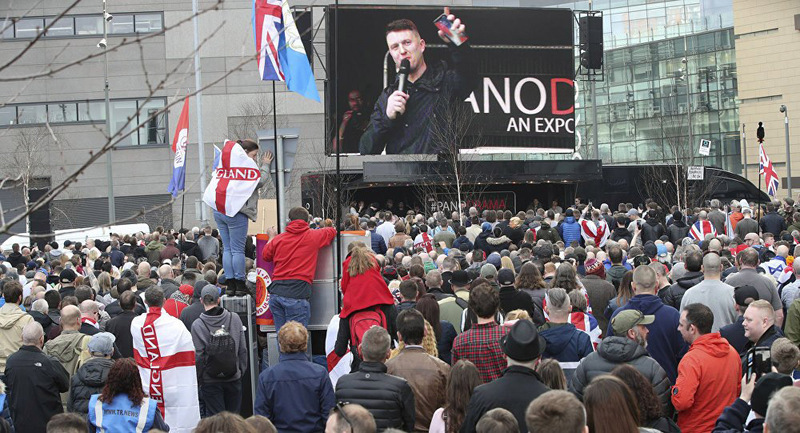 Estimates of the size of the Salford event ranged from 3,000 to 4,000 – Robinson’s old organisation, the English Defence League, reached these sorts of figures only at its peak. This sizeable number turned out although the event was not primarily based on Islamophobia – the glue that binds his supporters together – but had the media as its main theme, with the video as the centrepiece. This was also the first of Robinson’s recent series of demos to take place outside central London – other than the snap “Free Tommy” protest against his jailing, in Leeds, in June last year. But Manchester was the scene of his first return to the streets since the effective demise of the EDL, when he brought thousands onto the streets in June 2017. Unlike the EDL, the new movement around Robinson does not have a formal organisational structure or local divisions or branches. It is a much looser phenomenon, with no organisation that can direct a national mobilisation or organise supporters from one area to travel to another. Instead, “Tommy” issues the call and he now has a sufficiently large following for large numbers of his supporters to answer. There are smaller networks operating within the wider movement – the remnants of the EDL, the football hooligan firms (with or without the umbrella of the Democratic Football Lads Alliance), the plethora of far right social media pages and so on, which can bring in sections of the crowd. But most of those on Robinson’s demos appear to have come on their own account and those in Salford demo were mainly from the greater Manchester area or nearby northern towns. 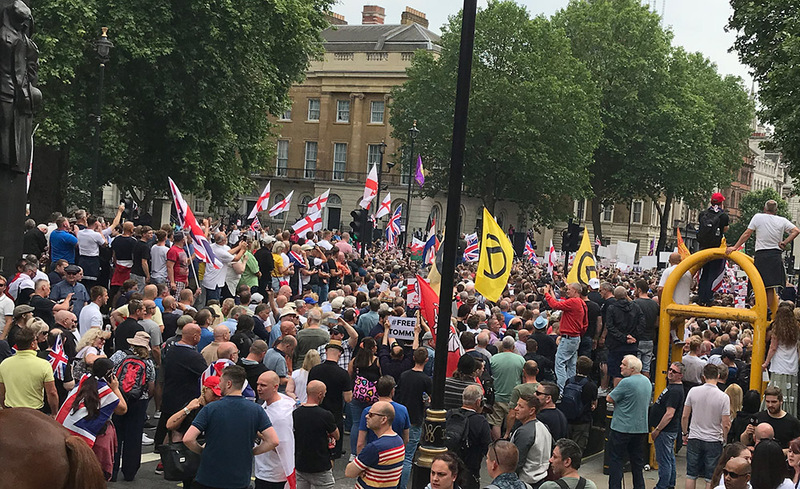 The event showed Robinson can pull sizeable numbers outside London – and this is a serious concern, as he announced at the rally that he was planning a series of documentaries and would screen them in other cities. This sort of far right tour is a clear threat, potentially replicating the EDL’s mobilisations but on a potentially much larger scale. Robinson will also seek to capitalise on any protests over the Brexit issue on 29 March and around his retrial – now expected in May – on contempt of court charges. Robinson receives funding from Canada’s Rebel Media and the US far right “thinktank” the Middle East Forum, in addition to his merchandising and donation farming operation. His ability to secure money from far right organisations means the loss of his Facebook account is unlikely to starve him of funds. And, as with the wave of Tommy Robinson events during the summer, the Salford event was another well resourced production, with a giant video screen and music to give the rally the feel of a festive day out. Attendees were also treated to another speech from UKIP leader Gerard Batten. The tie-up with Robinson is part of Batten’s strategy for rebuilding UKIP, whose membership had plummeted since its highpoint in 2015. As we have noted before, this is a break from the policy of former leader Nigel Farage, who sought to distance UKIP from overtly fascist organisations and from the EDL. We looked at the tie-up between Robinson and Batten’s party, and what it means, in more detail here. But Batten’s strategy appears to be working. UKIP’s membership has grown by around 50% in the past year. It soared by 15% in just one month – July 2018 – after Batten appeared with Robinson at his London rally. The new members coming in are attracted by Robinson and his street mobilisations, shifting UKIP even further to the right. Robinson’s Panodrama “documentary” mainly targets the BBC’s Panorama team. But it also hits out at Hope Not Hate – and the campaign group was swift to threaten legal action over a series of allegations made in the video. We do not wish to repeat Robinson’s allegations here. But it is worth noting that the early part of Panodrama centres on a young man who claimed to have been fired from his job as a City banker with Standard Chartered bank following an expose by Hope Not Hate. In fact the young man is Tom Dupré – formerly leader of GI’s UK group. Far from being a poor, helpless victim Dupré was the main mouthpiece in Britain for GI’s white supremacist politics – something it is easy to imagine would not go down well with a major international employer, or his fellow employees there. The inclusion of this segment highlights how close Robinson has become to GI. But the bulk of the video follows a cleverly executed sting operation against John Sweeney, the journalist leading the BBC Panorama documentary on Robinson. Sweeney had apparently approached Lucy Brown, an on-off ally of Robinson’s who had a bust-up with him last summer. Brown is also a keen associate of GI – and its distinctive yellow and black “lamda” logo can be clearly seen on her laptop computer in Robinson’s film. Brown agrees to talk to Sweeney but, unknown to him, she covertly films their meeting in a bar. She and Robinson also combine to send a fake “threatening text message” to her phone in Robinson’s name. The covert footage released in Robinson’s video shows Sweeney flashing his cash to buy hundreds of pounds worth of drinks and – appallingly – making a series of racist and homophobic remarks and comparing working class people to “cannibals” from the Amazon. In addition, Sweeney appears to be trying to put a gender related or sexual construction on a row that Brown describes having with Robinson. Later in the film, Robinson confronts Sweeney and the Panorama team with the covert footage that illustrates the BBC man’s own bigotry. And when Sweeney attempts to hit back by producing the “threatening text message” – the climax of the sting, which the audience has seen being set up – the crowd at the Salford rally laughed appreciatively. Robinson’s video is contrived to make himself appear a victim, while painting the media in general as an untrustworthy enemy. Panorama has, historically, provided occasional useful exposes of fascist organisations, such as its documentaries on the British National Party, the violent nazi Combat 18 group and nazi infiltration of England football fans in the 1990s. This was serious investigative journalism. These programmes were made in a way that clearly attacked the fascist organisations, exposing their politics and violence. Sweeney, by contrast, appears in the footage to rely on general muckraking – and on a source who is clearly and unapologetically active in the far right. This is poor journalism. The producers walked into an obvious trap in seeking to use Lucy Brown as a source to expose Robinson. Although she had a falling out with him, there is no evidence at all that Brown has in any way abandoned the far right – the idea that she could be trusted by serious journalists was, at best, naive. In fact, she double-crossed Panorama by setting up the sting with Robinson. John Sweeney’s own bigotry, as revealed in Robinson’s clips, also means he was never going to be best placed to expose Robinson’s politics. It is important for antifascists to defend the operation of a free press and genuine investigative journalism. This doesn’t mean we have to be uncritical of the BBC or mainstream media – not least because the mass media has played a big part in maintaining the climate of anti-Muslim and anti-immigrant racism on which Robinson and other fascists thrive. But whatever the faults of the BBC or the mainstream news outlets, no one should be in any doubt that having fascists intimidate journalists or mainstream media organisations would make the situation far worse. We cannot have fascists dictate what is reported. The National Union of Journalists has rightly spoken out against Robinson’s threats and attacks. The NUJ warned that “intimidation, threats and violence carried out by far-right protesters systematically targeting the media, especially photojournalists” were “becoming more frequent”. This is a dangerous and worrying development. Robinson is tapping into people’s distrust and resentment of the mainstream media for his own purposes. When Robinson claims to be fighting for “free speech”, he is actually demanding a platform to spread racist hate and fascist politics. Robinson’s attack on the media in general and any attempts to investigate him in particular place him in a long tradition among fascists and the far right. Fascists are keen to use the media as a platform for their ideas and to raise their profile, on the basis that all publicity is good publicity. The reason that Robinson has been able to build a huge social media profile in the first place – with more than a million followers first on Twitter and then on Facebook – is because he has had massive exposure over the years in the mainstream media. Rather than deny him a platform, the BBC and other broadcasters have repeatedly given him air time, allowing him to grow his brand and normalise his anti-Muslim racism and other ideas. This is the reason why antifascists traditionally argue for “no platform for fascists”. Even where the media or individual journalists claim they are going to “out argue” the likes of Robinson, the exposure that he or other fascists gain is invaluable to them. At the same time, Robinson and those who share his politics also want to attack the press, not only to deter criticism of their politics or actions but as part of creating an alternative world view. Donald Trump, the far right US president, has notoriously finessed the art of attacking the press. From his position of power he loudly denounces any independent or critical media outlet as “fake news”, insisting on his own versions of events. Attacks on the press have a long history on the far right. Hitler used the term Lügenpresse or “lying press” as a key propaganda theme. More recently, the anti-Muslim racist street movement Pegida took up the term in Germany. And in a video posted on 18 March, Robinson threatens unspecified action over the next week against “people who’ve lied”. The far right is instead developing and promoting a huge network of social media sites that propagate its own noxious politics, vile racism and conspiracy theories. Robinson wants a public image of himself reflecting his own twisted notion that he is a heroic victim of persecution, and normalising Islamophobic and other racist views. Attacks on the mainstream media or antifascist journalists – by rhetorical or physical means – are not coincidental, but a part of a strategy of propaganda, intimidation and control. Just how far this can go was illustrated by video released by Robinson on YouTube on 27 February. As part of his fulminations against the Facebook ban, Robinson repeated GI’s “Great replacement theory” – the idea that white people are being driven out or “replaced” by non-white and/or Muslim “immigrants”. GI wants to see “reverse migration” – non-white people being removed from Europe. An even more conspiratorial version of the theory holds that Jewish people are in some way responsible for organising this “replacement”. At the notorious white supremacist rally in Charlottesville, Virginia, in August 2017, where antifascist Heather Heyer was murdered, chants included “Jews will not replace us”. In his video rant, Robinson ties Facebook to the government and then to the supposed “threat” of migration, using GI’s theory of “replacement”. There’s evidence now Facebook sat down with Islamists, radical groups… Facebook sit down, take instructions. The government work with these radicals. All of them work hand in hand for their agenda. Their agenda is the replacement of you, each one of you, of us, of our culture and our communities. The influx of open door migration from the Middle East. The replacement that’s happening across the world of Western civilisation with barbarians. And we’re supposed to keep quiet. And you can see the lengths they will go to silence us all. In Britain GI is a tiny group, but the fact that it now has Tommy Robinson to articulate its nazi ideas to a mass audience is very dangerous. The Christchurch massacre is just one example of how dangerous these ideas can be when taken up by a single individual – and Robinson is building a mass movement.